We have created a short report about the earthquake and its imapct on Japan. At 14:46JST on Friday, March 11, 2011, the largest-ever-recorded-in-Japan earthquake shook the northeastern part of the Honshu Island of Japan. The island of Honshu is the largest island in the Japan archipelago that runs southwest to northeast and is about 810 miles long, and 31 to 140 miles wide. The capital city of Tokyo is on the east coast(Pacific Ocean side), right around the middle of the island. The epic center of this earthquake, in the Pacific Ocean, is determined to be about 100 miles directly east off the coast of Miyagi prefecture which is about 200miles northeast of Tokyo. <?xml:namespace prefix = o ns = "urn:schemas-microsoft-com:office:office" /> This earthquake was initially estimated to be 8.8 on the Richter scale (magnitude) at the epic center, but subsequently upgraded to 9.0. The magnitude of this quake is the fourth largest in the world since 1900. The tremor shook the northeastern part of the island with magnitude of 7 plus, causing extensive building, road, railway and public facility damages. The tremor of 6 plus was felt in Tokyo, about 350 miles for the epic center stopping all public transportation in the metropolis. The damage did not end there. The quake caused huge Tsunami waves, up to 14 ft., causing massive disaster along the eastern coast of Honshu. In some areas, water was reportd to have reached over 6 miles inland. Many cities along the coast were totally wiped out. Sucking 100�s, if not 1,000's, of people out to sea who could not escape. As I returned home safe to Denver this week, this will be my last posting on this page. I recently saw an article on National Geographics's web site that the great earthquake was powerful enough to shorten the day by 1.8 microsecond and added 6.7 inches to the wobble of the planet rotation. Also certain parts of Japan shifted as much as 13 ft. I guess, we may need to change the map soon. In terms of the impact of the disaster to global economy, we are beginning to see the aftermath and undoubtedly, there will be more. Many automobile manufactures are operating at reduced rate or have stopped production of certain models due to lack of parts from the factories that are in the Tohoku region. Already, there is a shortage of a popular Hybrid automobile at the auto dealers in the Denver area. Some large brand electric manufacturers are curtailing output for the same reason. The nuclear plant incident is causing the people around the the world to rethink nuclear generation. While the current renewable energy sources are far from the cost-performance of nuclear generation, we may be forced to reconsider energy policies around the world. However small or unfounded, there is a rising concern of radioactivity in the food chain in Japan as well as in other countries. The cost of disaster relief efforts and rebuilding people's livelihood will be astronomical, casting doubts around Japan's fiscal health and will cause inevitable consequences to other economies around the world. Feeling an urge to get some distance from the disaster, I visited Kanazawa city on my way back from a business trip during the last week in Japan. 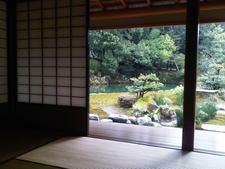 A moment in the tea room at the Kenroku Garden gave me a chance to settle down and recollect my entire experience of this particular trip to Japan. As I close this entry, I sincerely pray for all of the people in the Tohoku region and wish nothing but Godspeed for a rapid recovery. I am sure Japan will come back, but will need a lot of support from friends around the world. Please share in the effort to help rebuild the lives of hundreds of thousands of people in Japan. According to Asahi Newpaper, the total number of casualties has topped 12,000 confirmed deaths. The number of missings is now at 18,000. The final count is yet to be determined, but the number is likely to surpass the 30,000 mark. While the researchers are still working to size the tsunami, it has been reported that the height of the wave has reached over 15 meters (49 ft) in some locations. They have found places where the wave ran uphill and deposited debris as high as 37 meters (121 ft) high. They found a fire engine washed up on a hill 30 meters high. While most of the concrete building structures held ground, some were totally dislodged and were toppled. While the highest record that a tsunami has ever reached is 48 meters caused by the 2004 Indonasian disaster off the coast of Sumatra, the researchers believe that it is likely that they will discover places that are highere than the 2004 Indonesian disaster. The Fukushima nuclear plant continues to be a serious concern, but the combined task force of not only Japanese, but international specialists, are working around the clock to restore order. While there are some radioacitve water leakage into the ocean and the 30 Kilometer perimeter evacuation is still in effect, the airborne radioactivity counts in the surrounding prefectures and Tokyo have more or less returned to normal levels. One piece of good news. However, the power shortage in the Tokyo and the surrounding prefectures is still a critical issue. The entire area is trying hard to reduce consumption; train services have been curtailed, store lights and neon sign have been dimmed, stores are closing early and the nocturnal metropolis is shutting down earlier every night, impacting business activities and people's lives in every way imaginable. Some corporations have temporarily relocated headquarter operations to western Japan to avoid any business disruption. The summer power peak will be more than 125% of the currently available supply, Eastern Japan will undoubtedly suffer loss of productivity and other business disruptions during this summer. It is still too early to speculate on the magnitude of the impact, but certainly not small. This odd situation is due to the origin of the generators imported into Japan when electricty was first introduced during the Meiji era. Western Japan used generators made in Germany, while the east used ones from the US. The difference continues to exist today. While it will be a major undertaking, the current situation may be an opportune timing for Japan to attempt to unify the power infrastructure. Another initiative that Japan should launch is an accelerated building of the Smart Grid and distributed generation and storage technologies that the US has started just a few years ago. The mechanism to balance electrical "supply and demand" through "Demand-Response controls," the ability to integrate distributed generation facilities including biogas, wind, solar and other technologies into the current power grid, and the ability to store electrical energy to ride through peak demand periods are all very critical components of the Smart Grid technlogy. Since electrical power supply has been relatively stable in modern Japan, such initiatives have taken somewhat of a backseat. Now is the time to revolutionalize the infrastructure. The total number of confirmed deaths has surpassed the 10,400 mark. As rescue efforts continue, the number continues to rise. With over 18,000 still missing, the toll is likely to be far worse that what we see now. This is definitely the worst natural disaster to hit Japan. My prayer goes out to all those affected. It has been reported that the Tsunami, the highest reaching over 14 meter (42ft), has flooded a total land area of about 500 Sq. Km (about 200 Sq. Mi.) Much of that area is once fertile farm land that will be unlikely to yield any crop for at least next several years due to high salt concentration. The people have lost housing and social infrastructure and any means of making living with fishing boats and farm land. There will be a long and arduous road ahead for all the affected people in the area. Please help with donation efforts that are springing up around the world! Things are slowly coming back to normal around the Tokyo Metropolitan area. Thanks to voluntary power saving efforts by the railways and commercial institutions, planned outages did not occur in the Tokyo metropolitan area this weekend. The lights are dimmed inside all stores throughout the city, and the usually bright neon signs have been drastically curtailed. From the outside, many businesses look like they are closed. I visited a local bar/restaurant and the owner was lamenting about the dramatic pullback of the clients. Many eateries have been hit hard. While the months of April to May are relatively low in terms of electrical demand, this summer and the winter will be faced with severe lack of elcetrical power. TEPCO is predicting that they can supply only about 45 to 47 Giga Watts(GW) of power against the predicted demand of around 60GW, more than a 20% shortfall. The government is already coordinating efforts with large industrial and commercial users to curtail operation to ease the demand, as well as investigating other possible measures. Coupled with so many manufacturing plant shutdowns in the disaster area, the impact of the disaster on Japan's economy is just unfathomable. I don't want to downplay the precarious situation at the Fukushima nuclear plant which I believe can be resolved, but beyond that, there will be an unimaginable and inevitable consequences and hardship for everyone in the country for years to come. As reported by Asahi Newspaper, the total number of casualties have surpassed 9,500 people as of Thursday morning, March 24. The total missing stands at 18,800. Relief efforts are finally reaching the disaster areas. The major highways are open, railway system is being routed through unaffected areas, and some docks are now receiving shipments via sea. However, close to half a million people are living in over 2,200 evacuation centers, school gyms, community centers and other makeshift housings in the disaster area that are scattered across more than 500 Km (300 miles.) You can imagine the logistics nightmare with many local roads still very spotty at best. I visited the headquarter of Japan Red Cross to make a samll donation, the least I can do at the moment. Although late in the afternoon, the staff were all in field work uniforms, briskly going about their business. They have already started sending relief teams as well as taking initiatives to collect donations for the releif effort. I am sure you are getting earful of news from the media. Although the situation is still critical and requires fire engines to continue spraying sea water into the spent fuel rod pool inside the reactor housing, the situation seems to be under control as indicated by the airborne radiactivity levels which have since decreased. TEPCO has connected power to #1 and #2 and is now diagnozing the system to bring up the cooling system. Cables have been laid out for #3 and #4 as well, but this recovery is expected to take time. The #5 and #6 that were in cold stop condition at the time, have power restored and the cooling of these two seems to be normal. At this time, all indications show that a total meltdown and subsequent fallout as predicted by some news media is highly unlikely. The government halted shipments of broad leaf vegetable (e.g., Spinach) and milk from the area, as they detected elevated levels of residual radiation. The Japanese agricultural standard for residual radiation is such that even if that particular food was consumed continuously for a full year, the accumulated radiation level is several folds less than what is commonly accepted as tolerable. To put things in layman's term, if one were to drink a quart of the milk from Fukushima, every day for a full year, the accumulated radiation will be equivalent to having one or so chest CT scan. Is that a health hazard, especially given that most of the radiation is Iodine 131 that has a half life of 8 days (i.e.,radition will continue to be halved very 8 days)? As of this morning, the total death toll has surpasessed 8,800 people. Missing is now over 18,000. 1. The serenity in the disaster area: The calmness, compassion towards others, patience and the law abiding-ness of the people in the disaster area is just out of this world. Despite the calamity and lack of any law enforcement presence in the area, the people remain calm in evacuation centers, share food, water, blanket and whatever else they have with others. Everyone stands in well organized lines to wait his or her turn for receiving food. There was only one news coverage that I saw during the entire ten days that showed local volunteers patrolling the wrecked neighborhood to prevent any theft. No big riots, supermarket raids, or fight for food in centers. Amazing. Remember what happened during Hurricane Katrina and other similar disasters in other parts of the world? 2. Bad news sells: It seems like the news coverage I saw in major overseas media is either blown out of proportion or the Japanese media is not telling the truth. I think it is both and the truth is somewhere in the middle. I saw some news headlines, selling the news with the worst possible spin to cause eyes to roll. Many news media simply touted "radiation is x times the normal level, etc. etc.," instead of giving scientific analysis of what the actual value is in comparison to known hazard levels. 3. Business as usual in Tokyo (well, almost): Although many business have curtailed activities, the critical activities like logistics, fuel production, food production, public transportation have resumed to almost normal level. The planned power outage continues, but people are coorperating to curtail deman; stores are dimmed, streets are dimmed, train services is somewaht curtailed, heating demand has been cut, all voluntarily. As a result, most of the the party districts in Tokyo are quite empty early in the evening. 4. The entire country is pulling together: The people in the disaster area are being offered temporary living quarters in other prefectures with adequate facilities like school buildings, community centers, empty public housing etc. The entire town close to the Fukushima plant has relocated to a large athletic compound in Saitama prefecture and are given full support by local community. Fire fighter from over 500 miles away are moving in with fire equipment to Fukushima plant and disaster area for support. Volunteers from all over the country are registering with authorities to move in upon request. In some evacuation centers, schools have resumed. It is quite remarkable to see the resilience and the determination of the people and the nation to comeback so soon after the worst ever recorded natual calamity. The firefighters and the Japan Self Defense Forces are continuing to spray sea water into the spent fuel rod pools located in the two critical reactors #3 and 4. They seem to be making some progress, as there is no further spike in the radiation level at the site or elsewhere. Tonight, the Tokyo metropolitan fire department has brought in a high-rise fire fighting engine, and connected that with over 800 meters of hose that extends to a pumping engine located by the sea side. This system will allow for unmanned operation to allow for continuous pumping into #3, minimizing radiation exposure to fire fighters. This morning, a temperature reading was taken for the reactors that indicated less than 100 degrees celsius, below boiling point, indicating that the water is indeed being replenished. Tonight, TEPCO suceeded in connecting external power to reactors #1 and 2 and will commence testing and operation of the emergency cooling system soon. This will be a major milestone. While not out of the woods, the situation seems to be headed in the right direction. The death toll for this disaster has surpassed the 7,000 mark this morning. WIth so many missing, the total tally is unimaginable. Today is Saturday, a family shopping day in Japan. The local stations, department stores and supermarkets seemed fairly normal, except for dimmed lit floors and still some half-full supermarket shelves, as people continue to stock pile. I saw several people with large suitcases and buying a whole shelf worth of canned goods. I don't know what they intend to do, maybe be philanthropists by sending those good to the disaster area. In the meanwhile, numerous volunteer group have started fundraising activities to help with the relief efforts. I saw a group of young students collecting for Japan Red Cross. Lights were dimmed in stores. The masks that the ladies are wearing are not for radiactivity prevention, they're for pollen allergy as flying pollen is abundant in the spring. Young students line up for disaster relief fundraising. The Japan Self Defense force along with the Fire gfighting brigade, continue to pump water into the spent fuel rod pool to keep the water level. The situation is not getting worse, so they seem to be able to keep it from escalating. The Nuclear Agency today raised the incident level to levle 5, same as the Three Mile Island. The radiation level around the nuclear plant is still high today, but the highest level measured in the Tokyo metropolis area, 250Km away, is down to a normal level, with the highest measurement at 0.0502 Micro Sv per hour. (That's one thousandths of a chest X-ray level). TEPCO is working around the clock to make power connections to revive the cooling pumps and other gear inside the facility. As of this morning, March 18, Asahi Newpaper reported 5,700 plus deaths, and 17,000 plus missing. (tonight, NHK reported death toll at 6,500. Main highways are now open and about 97% of the main highway running along the coast is now open to emergency vehicles. Over 4 ports along the Pacific coast are open, Sendai Airport opened one runway and a USAF cargo plane was one of the first to land there. Land, air and sea access should dramatically improve the ongoing releif efforts. In fact, loaves of bread were stacked high in the aisle due to lack of shelf space. The surroudning suburbs around the Tokyo metropolis continue to experience planned power outages to avoid uncontrolled massive power outages. As such, many workers have stayed home or are working shorter hours. I am impressed with the robust production and distribution system around the metropolis, despite power outages. The supermarket shelfs that were empty only a couple of days ago are now well stocked. There were even road side vendors selling bags of rice that were brougth in from other parts of the nation. What also surprised me is that none of the stores or even the road side vendors are trying to take advantage of the situation with elevated prices. The business activities seem to be coming back a little, but still not at a normal level. The usual crowd around the terminal station was not there, and there was a long line of cabs waiting for customers. The business is slow, as evident with a long line of taxis. A cabby was napping inside his car, indicating how long he plans to stay put. You may be hearing a lot of grim news from the news media about the situation at the Fukushima nuclear plant, but TEPCO with the help from the govenrment, Japan self defense force and Police agencies, are making every effort to avoid the worst. Please remember that bad news sells and the news media is capitalizing with headlines like "radiation level of 20 times normal, 30 times normal etc." However, even at the 20 Km radius established as the evacuation radius, the radiation level only peaked at about 23 Micro Sievert per hour for a few minutes. This is about half the dose of a chest X-Ray. If one stood outside completely naked for two hours and provided that the radiation level remained constant at 23 Micro Sievert, you just had one chest X-Ray. The highest recorded level in Tokyo two days ago was at 0.8 MicroSievert, which lasted probably less than a few minutes at the most. Yes, this may be 20 times higher than normal, but a roundrip coast-to-coast plane ride exposes you to a total of 200 MicroSievert. Provided that 0.8 Micro Sievert level of radioactivity in Tokyo remained constant indefinitely, the amount of radiation one receives on a coast to coast plane ride is equivalent to standing out in the open in Tokyo, stark naked for 160 hours. I don't intend to do that for sure. The Self defense force and the police are using every possible means to fill the coolant level of the spend fuel reservoir; helicopter airlift, water gun etc. Yes, the incident is serious and I am not trying to downplay that. We are definitely not out of the woods yet, but one must understand the science and facts to gauge the crisis level. Unless something really really bad or stupid happens, I am confident that the situation will be brought under control. Even in the worst case, it is unlikely that the situation will reach the level of Chernobyl disaster, due to the structural differences of the reactors. For those who may wish to read further on the nuclear reactor matters, check out this web site created by MIT. As of this morning, Asahi Newpaper reported over 5,100 confirmed casualties and 16,400 missing. The number of people in evacuation shelters have reached half a million. Staggering! Although quite challenging, disaster relief supplies are beginning to reach the devasted area via military and private trucks. The docks and railway system is being worked on around the clock to improve access. Although my meetings were cancelled on Monday and Tuesday, the activities in the capital city is beginning to return. I communted to my morning meeting in downtown Tokyo today. The trains were much less crowded than normal, maybe about 50%, but people are now returning to work. I also learned that many of the companies have instituted work from home policy for the week which explains the lack of usual commuter rush. The supermarket shelves that were mostly empty yesterday are now being restocked. The only concern is the rolling planned outages that have been instituted in the metropolis area to ensure stable supply of electricity. TEPCO is cutting power to each of the 5 planned districts for about 3-4 hours every day. Furtunately, downtown Tokyo area is excluded from the blackout due to the criticiality of essential government and business activities located in the area. However, the suburburban communities and train systems are being curtailed. This will have impact on the ability of people to commute, and resume normal activities. Following an explosion at #2 reactor this morning, there was a fire on reactor #4. All four reactors at Fukushima #1 are having problems. TEPCO and the nuclear agnecy staff are fighting to cool the reactor core with sea water. Although not yet an immediate health hazard, higher levels of radioactivty are being observed in the surrounding prefectures, as far as Tokyo. In addition to evacuation of residents within a 20Km (13 mi) radius, a warning advisory was issued today for residents within a 30Km (19 mi) radius to stay indoors. The lastest casualty tally, as of afternoon of March 15, is now over 3,000 confirmed dead and over 15,000 still missing. There are over 460,000 people in shelters throughout the four prefectures in the north eastern part of the island. The number is likely to go up, as the nuclear power plant problem continues to force people to evacuate. Due to planned power outages starting Monday, public train system in the metropolitan area have curtailed services drastically. There was chaos yesterday at major terminal stations around Tokyo, but it looks like many people just cannot commute or decided to take the week off. Many companies have shutdown or instituted work from home policy. to This is a picture of Shinagawa station, a little after 5PM. The station concourse and platforms are normally very crowded at this time of the day, but not today. Shinagawa Station platform at 5PM looked quite empty. The impact of the disaster on Japan's economy will be severe. There are many manufacturing facilities of the largest manufacturers like Toyota, NEC, Toshiba, Sony, Nissan, Mitusbishi, Fujitsu. Only about half of the floors had lights on at 5:15PM. Empty supermarket shelf, where's the rice? Many of the daily essentials have diappeared from the shelves of a local supermarket. Partially due to people's urge to stock up during an emergency, and partially due to much of the essentials being diverted to the disaster area. Other stores in the neighborhood were not much better. Empty supermarket shelf, No Eggs! Empty supermarket shelf, No Meat! Empty supermarket shelf, No Bread! Local bakery looked empty, except for a few pastries. Same conveninece store, empty, except for beer and liquor in the refrigerator in the back. <?xml:namespace prefix = o ns = "urn:schemas-microsoft-com:office:office" />Since Monday, TEPCO (Tokyo Electric Power) instituted "planned outages" across its service area since the loss of the nuclear power plants is causing serious power shortage. The public train system is operating in reduced schedule, causing serious disruption in business activities and personal life. Supermarket shelves in the metropolitan area were empty yesterday, Sunday, as people rushed to stock up on food, water, living essentials, batteries and candles. The utility plans to reopen fire generation facilities to compensate, but this will take time. Despite the continues efforts to pump sea water into the cooling system, the cooling water level dropped again in Reactors 2 at Fukushima Plant #1, exposing the fuel rods. A large explosion was heard at 6:10JST with ensuing rise in the radioactivity level. A serious damage to the reactor enclosure itself is suspectecd. This damage will result in leakage of radioactive coolant and lead to serious problems. Nuclear plant is acting up again! They have counted over 1,850 dead, and over 12,000 missing as on Monday night, Japan time. The US rescue specialists, along with specialists from 13 other countries are working with Japanese Defense Force, police and fire fighters. The US naval vessel is on site, assisting rescue efforts and providing chopper support. I had a first-hand �Indirect experience� of this event. I was on United flight 875 from Seattle to Narita (Tokyo International airport about 50 miles east of Tokyo), and listening to the cockpit communication (UAL channel 9, for those who travel a lot), about a hundred miles from the airport, with less than 15 minutes to go for our 15:20 arrival. The cockpit crew was receiving approach instructions and descending to our approach flight level, when all of the sudden, the pilot cut off the passenger audio system feed. When I felt a sharp right bank and another right bank, then flying away from the airport, I knew something was going on. In a few minutes the plane made a couple more right turns, I realized we were in a holding pattern, a bit unusual. What�s wrong?? After holding for 10 plus minutes, the captain told us that there was a large earthquake and Narita runways have just been closed for inspection and that we were being diverted. <?xml:namespace prefix = o ns = "urn:schemas-microsoft-com:office:office" /> We flew over the airport and Tokyo and made a few turns and landed at the Yokota Air Base (USAF) to refuel. USAF base, about 50 miles west of Tokyo. We parked away from any military operation and waited for the fuel truck. After about two hours on the ground, we were given a clearance to fly to Osaka, Kansai airport, about 250 miles west. We land at Kansai and were told that the flight was terminated at Kansai and that we were all on our own to find accommodation and make our own booking. A huge challenge, given that the bullet train operation, running from Osaka to Tokyo, has been suspended as well due to power outage. More than 10 flights were diverted to Osaka, Kansai airport. Cell phone connection was spotty, one out of every 5-6 tries got through. Not a good sign. By that time, I made it out of the customs, I had already connected my laptop to the internet with a personal hot-spot WIFI Router that (fortunately!) connected to a local data comm. carrier. I had already read all major updates and knew we were in deep trouble. I offered whatever help I could; providing earthquake information, guiding people around the airport, giving out instructions on public transportation into the city. As for me, I took the last train out of the airport to get as far as Kyoto and after visiting about half a dozen hotels, I found a room. The bullet train service from Osaka to Tokyo was resumed on Saturday, so I was able to make it back to Tokyo. Fortunately, Tokyo area had minimal impact, only a few casualties due to falling building roof tiles, but the commuting public were stranded in the city on Friday night due to complete shutdown of the public transportation system and road closures. People slept on station floors, office buildings and whatever they can find. Maybe we were lucky to have flown to Osaka. Saturday night, watching the TV news, bad news continued to flow in. Two nuclear power plants in northern Japan encountered accidents, a possible core meltdown. (Remember the Three Mile Island?) Residents within 20 Km (13 miles) radius were being evacuated. The people in the disaster area were gathered in evacuation centers or are on their own, without power, water or food. Over 100,000 Japan Self Defense force personnel have been dispatched to the affected area and continue to help with the evacuation and life support activities. International rescue efforts are also being dispatched; The US navy vessels are already on their way to help with the effort. Several countries dispatched rescue specialists to Japan.